Nearly 300 flexible fingers are packed onto the face of this brush to provide ample surface area and incredible scrubbing power. The unique bristle material gently scrubs without irritating, massages as you clean, and produces more lather with less soap. Thanks to the long handle that's curved at the perfect angle, you'll be able to reach any body part, and due to the ergonomic grip, you'll be able to wash without strain or fatigue. Flip it over to the opposite side to reveal the interchangeable insert. 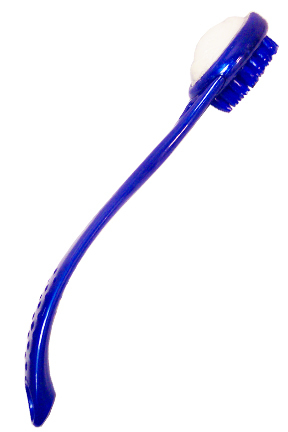 It comes with a bar of soap pre-installed, but you can also switch out for an exfoliating pumice stone, or a liquid soap dispenser that rolls on body wash. Because this scrubber is made from plastic instead of natural bristles or nylon, it'll never wear out, lose shape, or become ineffective with repeated use. The brush surface feels soft to the touch, but the advanced bristles have the ability to deep clean and remove stubborn grime without any harm to sensitive skin. Other back and body brushes are limited in their ability, and most force you to apply soap to the surface before you start washing. With soap on one side, and scrubbers on the other, this tool allows you to clean your body faster, but also more thoroughly. Start with the soap side to begin washing, then flip to the bristles to deep clean without effort. This tool comes equipped a bar soap insert already installed, but you can also get a pumice stone, or a liquid soap dispenser too. With this added feature you're able to have soap right where you need it, or the tough scrubbing power of pumice to exfoliate and remove dead skin. Long Handle. It's comfortable to hold, and curves slightly to give you the perfect cleaning angle. Use it as a back brush to get that spot that nobody can reach, or use it to easily wash all over without stretching or straining. Gentle Scrubbing. Not overly abrasive, but still able to do a good job, the flexible fingers on this brush will leave your skin clean and feeling great. Extra Inserts. Add an exfoliator, or attach a soap dispenser to use with your favorite body wash. With a variety of different inserts that connect to the back side of this tool, you'll be cleaner than ever, and you won't have to work hard to get that way. Versatile. Perfect for scrubbing your back when taking a bath or shower, but also nice for washing any other body part that is hard to reach. The long handle provides ample reach so anyone can wash legs, feet, arms and more without bending, stretching or straining. Long Lasting. 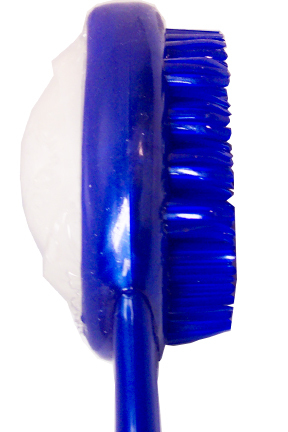 The bristles on this brush will perform like new for much longer than other options. Don't worry about loss of ability over time because this one will deliver incredible scrubbing power time and time again. Feels Great. Wash and massage your body simultaneously. 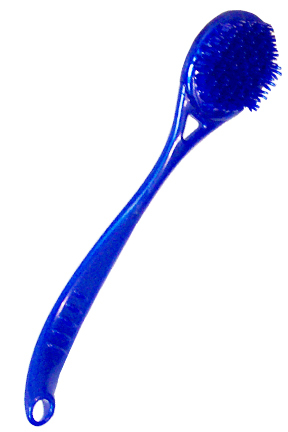 The bristles feel great against your skin, and are unmatched for their cleaning ability. You will be amazed at the amount of lather you are able to build, and how quick and easy it is to wash your whole body. Use one side to apply the perfect amount of soap to your skin, then flip over to begin washing and scrubbing. You can always flip it back over quickly to add additional soap where needed, and then keep on scrubbing, without slowing down. Get the other two inserts to add more versatility to this great tool. The liquid soap dispenser fills with any kind of liquid soap and allows you to roll it across your body to apply the exact amount of soap or body wash that you need. Pop out that insert and install the pumice stone to scrub and exfoliate your skin. It's great for the bottoms of your feet, and thanks to the long handle, you'll be able to reach those dogs without bending over all the way, or straining your body. This Deluxe Back And Body Brush would make a great addition to any tub or shower, and it's perfectly suited for cleaning backs, legs, feet and more. Brush Material Soft, flexible plastic. Uses Use the scrubbing fingers to clean hard to reach places. Flip to the back side to apply soap or exfoliate to rejuvenate skin. The long handle makes it easy to reach any part of your body. 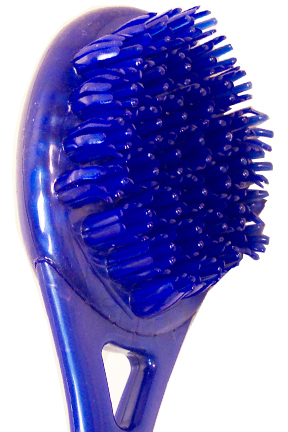 Scrub any hard to reach place with this back and body brush. Its long, curving handle makes it comfortable to hold, and easy to use. With a variety of inserts for the back side, you'll be able to scrub and clean any part of your body with very little effort. Order Yours Today! This back brush looks great but I haven't used it yet. Went to the website for this brush and found out how to order the stone to fit where the soap bar is. Sturdy materials. The delivery took longer than I thought it should, but it was due to an item being out of stock. When it did finally ship simplygoodstuff shipped it priority mail and I still got free shipping. I love this site and look forward to using it again. Wat I needed, works great for me. The brush is exactly what I ordered. I received this brush, today -- took "forever" to get here via USPS. Was disappointed in the "plastic bristles". They are very pliable and, over time I expect them to break off. The length could be five to six inches longer. The opposite side of this brush contains a cavity for a soap, soap dispenser or pumice stone. The soap is unnecessary, but if the dispenser can be used for anti-itch lotion, that will be good. A second brush insert with stronger bristles would be a good accessory. It was not clear that these accessories were available when I ordered the brush. So, I had to place a second order and pay added shipping. I have bought other back scrubbers and this one has been my favorite. It arrived promptly. Works as expected, thought the handle would have been a bit longer, but it's fine. Bristles aren't too stiff, so it's not overly abrasive. Seems to be a sturdy product. I would buy this again. Works great for cleaning my back. I like the fatter bristles. yes I am happy with this product. how long is the entire brush? They are pretty soft and very flexible. Your Feet Will Never Feel The Same! A Spa Quality Treatment Any Day Of The Week.